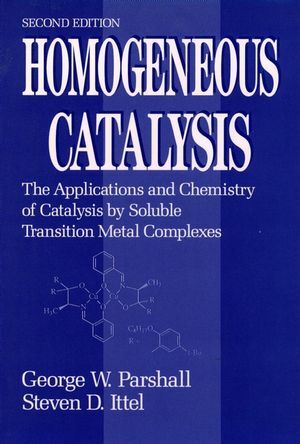 Contains a balanced discussion of homogeneous catalytic reactions that are used in industry, featuring every documented example employed in a current commercial process, or that have a broad application in the organic synthesis laboratory. Incorporates synthesis with chiral catalysts in chapters on hydrogenation, CO chemistry and olefin oxidation. New additions include Tennessee Eastman's coal-based acetic anhydride plant and IFP's Dimersol process for dimerizing propylene as well as major changes in the areas on pharmaceuticals, flavors, fragrances, agricultural and electronic chemicals. George W. Parshall is an organometallic chemist who made notable contributions to homogeneous catalysis. He was a senior scientist at E. I. du Pont de Nemours and Company for many years. Steven Dale Ittel is an American chemist specializing in organometallic chemistry and homogeneous catalysis. Trends in Homogeneous Catalysis in Industry. Reactions of Olefins and Dienes--Hydrogenation and HY Additions. Polymerization and Oligomerization of Olefins and Dienes. Oxidation of Olefins and Dienes. Carbene Complexes in Olefin Metathesis and Ring-Forming Reactions. Oxidation of Hydrocarbons by Oxygen. Esterification, Polycondensation, and Related Processes. Homogeneous Catalysis in Halocarbon Chemistry.